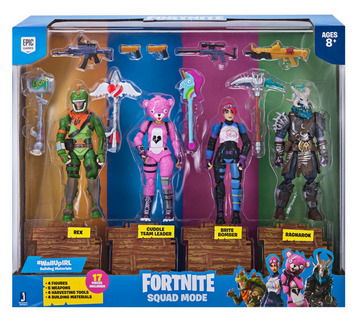 Target has the Fortnite Squad Mode Core Figure 4 pack for $39.99. Squad up and drop in! The Fortnite Squad Mode 4-Figure Pack brings Fortnite squads to life. Each 4-figure pack is full of Epic and Legendary outfits and much more! Each figure comes with a weapon and their harvesting tool. 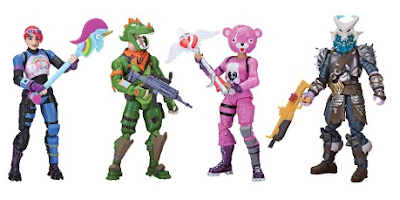 Ragnarok, Rex, Cuddle Team Leader and Brite Bomber are outfitted with the Heavy Shotgun, Dual Pistols, Semi-Auto Sniper Rifle and Scoped Assault Rifle.